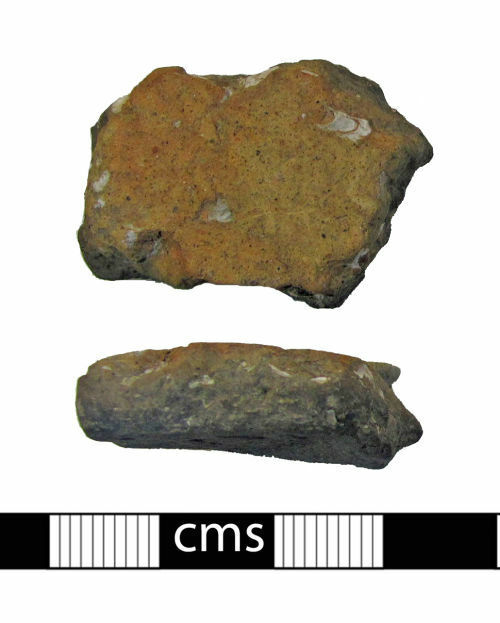 A small body sherd from ceramic vessel of probable prehistoric date. The fabric has a dark grey core with abundant shell temper up to c. 7 mm in size. Externally the exterior wall is pale orange-red in colour while the internal wall is dark grey. There appears to be a thin linear indentation for decoration across the sherd. Several pieces of prehistoric pottery spanning the late Bronze Age to late Iron Age, of which this is one, were recovered from a small area around Brightwell Barrow in the 1920s. Probably late Bronze Age or early Iron Age in date (c. 1000 -401 BC).